Japanese woodblock prints were a major influence on painting and other arts in Europe during the latter half of the 1800s, part of what has been termed Japonism(e). Several of the Impressionists collected these prints, and their paintings changed in response to what they saw in them. One of its earliest enthusiasts was Félix Bracquemond, and Vincent van Gogh, Monet, and Gauguin were among those who both collected and manifested Japonisme. 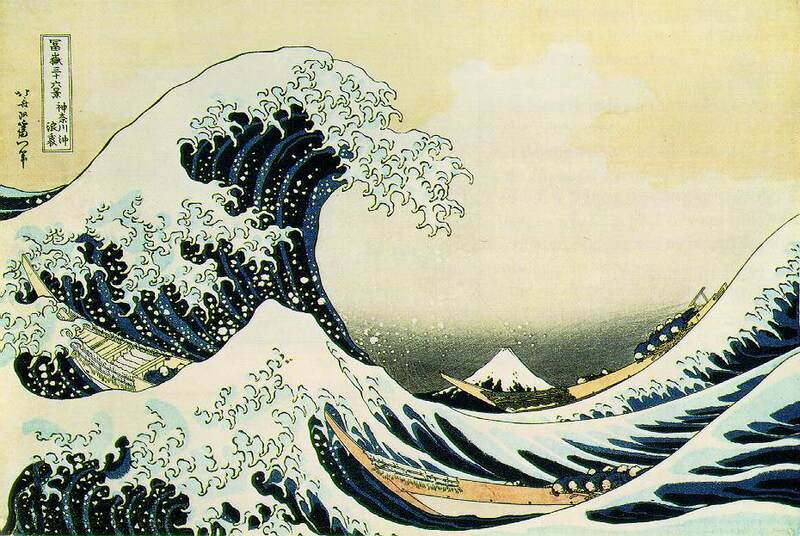 Katsushika Hokusai, The Great Wave of Kanagawa (1831), woodcut print, in “Thirty-six Views of Mount Fuji”, Private collection. WikiArt. Most of these prints, by masters such as Hiroshige and Hokusai, are known by the Japanese term ukiyo-e, which in the West is usually interpreted as meaning paintings from the floating world – ukiyo being a term for the hedonistic spirit which existed in the centre of Edo, now the city of Tokyo. This was celebrated in Asai Ryōi’s famous novel Ukiyo Monogatari, or Tales of the Floating World. Originally, ukiyo was an old Buddhist word meaning this world of sorrow and grief, which is a strange origin for such prints. Professor Victor Mair, one of the world’s greatest experts on East Asian languages, has recently published a blog article on Language Log in which he explores the origins and meanings of ukiyo-e: it is well worth reading. Posted in General, Language, Painting and tagged Bracquemond, Hokusai, Japan, japonisme, ukiyo-e, van Gogh. Bookmark the permalink.